This Panama Pocket Knife is a part of the Pocket Worn Whiskey Bone CV Family. Beautifully umber in tone, this genuine bone handle’s whiskey brown and burnt orange hues give it a beautifully vintage look. 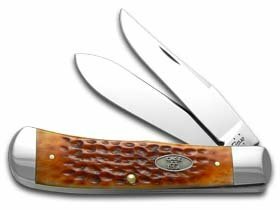 This durable folding knife features a pocket worn standard jigged whiskey bone handle with two full length blades, the clip and skinner blades. The Clip blade is commonly used as a multi-purpose blade and preferred for detail work. The Skinner blade is ideal for skinning purposes among other different everyday demands. This knife is constructed with our chrome vanadium (CV) steel. Some knife lovers will settle for nothing less than chrome vanadium blades, since this special formula of alloyed steel is the “original” Case blade steel. Case chrome vanadium blades are known for their edge-holding ability and easy re-sharpening. However, they are less resistant to rusting, pitting and discoloration than stainless steel. We recommend keeping a thin film of oil on the blade to maintain the finish. This ensures that your knife will be around for future generations to enjoy. This pocket knife is suitable for everyday demands, the outdoors, or hunting. Comes conveniently packaged in a box. Proudly made in the USA, hand-crafted by skilled artisans. Manufacturer: W.R. Case & Sons Cutlery Co. Publisher: W.R. Case & Sons Cutlery Co. Studio: W.R. Case & Sons Cutlery Co. If you have any questions about this product by Case, contact us by completing and submitting the form below. If you are looking for a specif part number, please include it with your message.